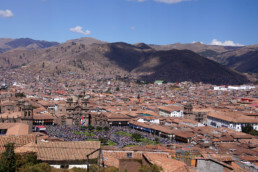 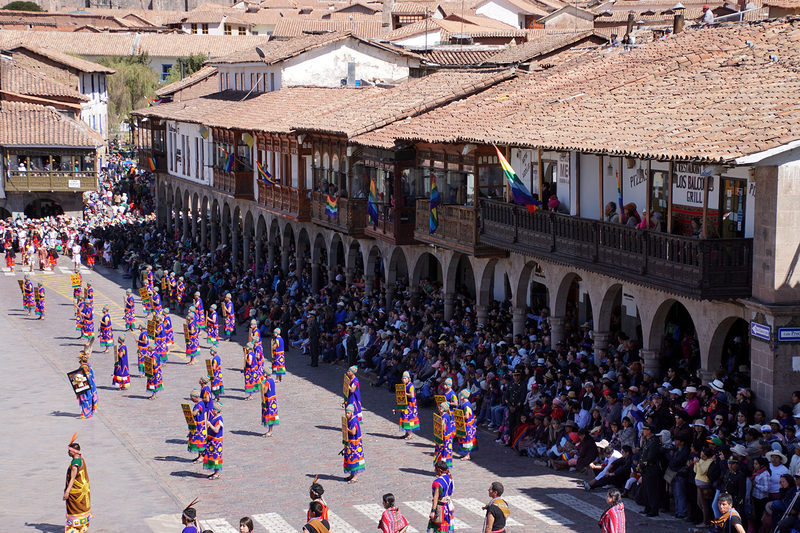 Quite different from Inti Raymi (Quechua for ‘sun festival’) in Pucara, Cusco was packed with rows of tourists standing on rented stools to catch a glimpse of the spectacle. 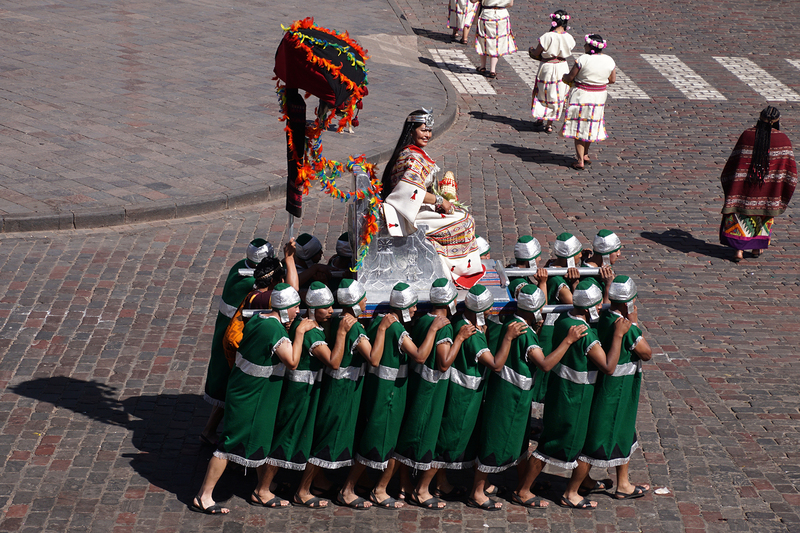 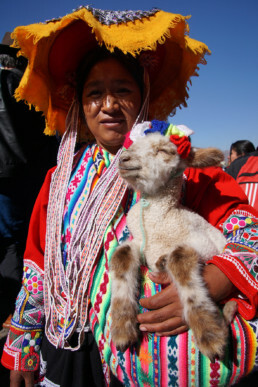 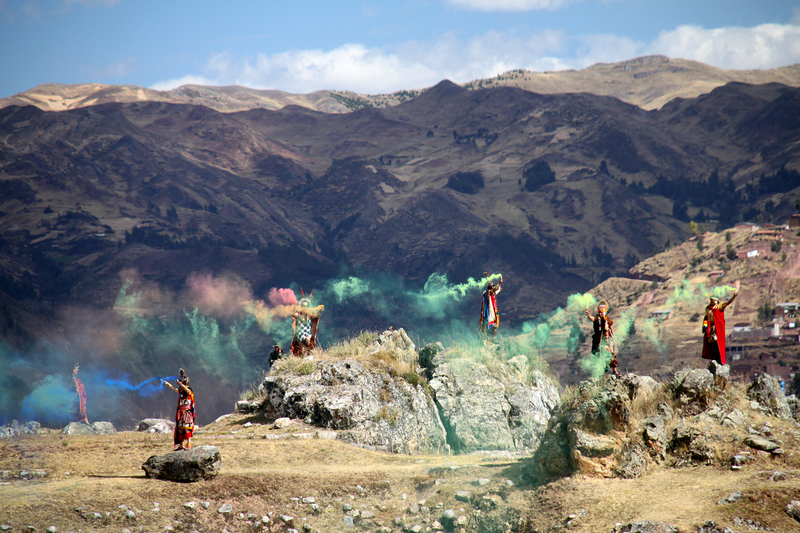 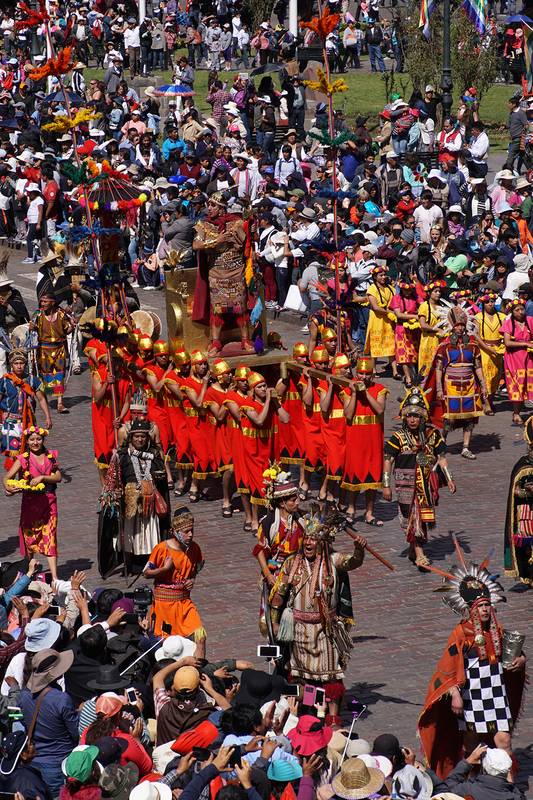 This millennia-old indigenous celebration of the God Sun, the most admired god in Inca religion, is celebrated in many Andean towns. 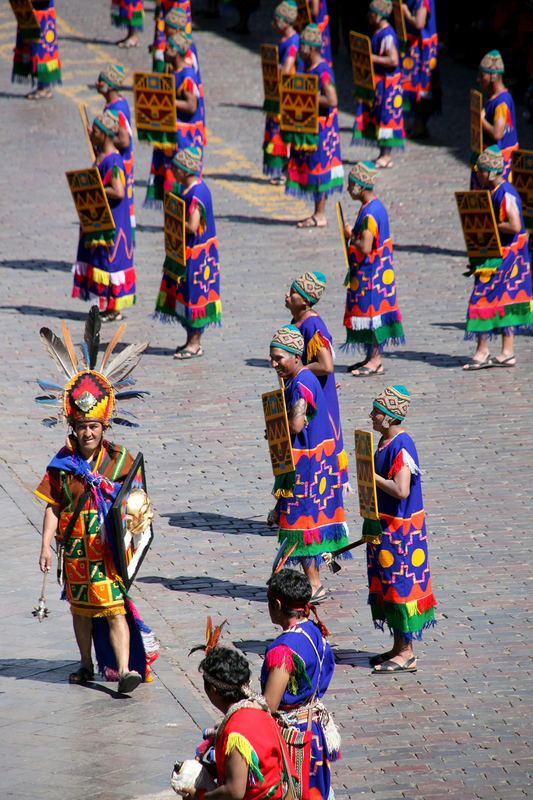 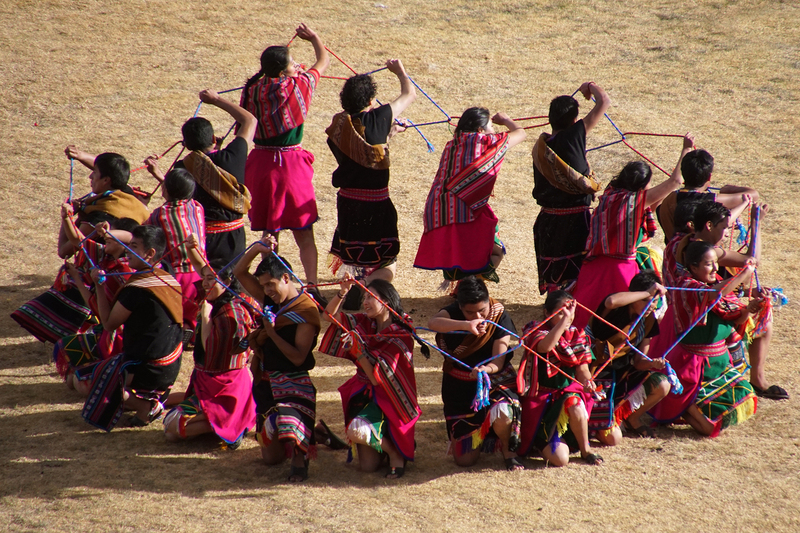 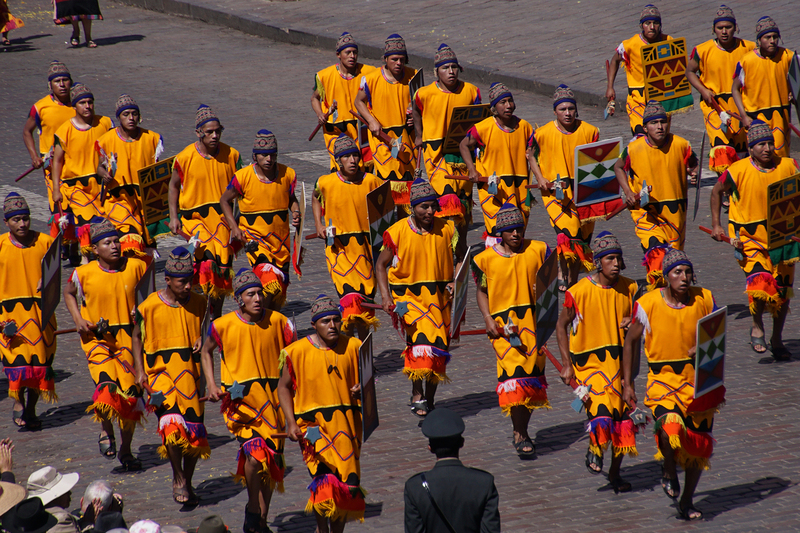 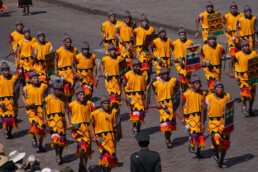 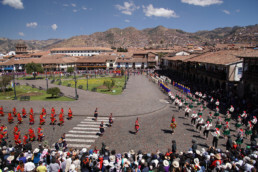 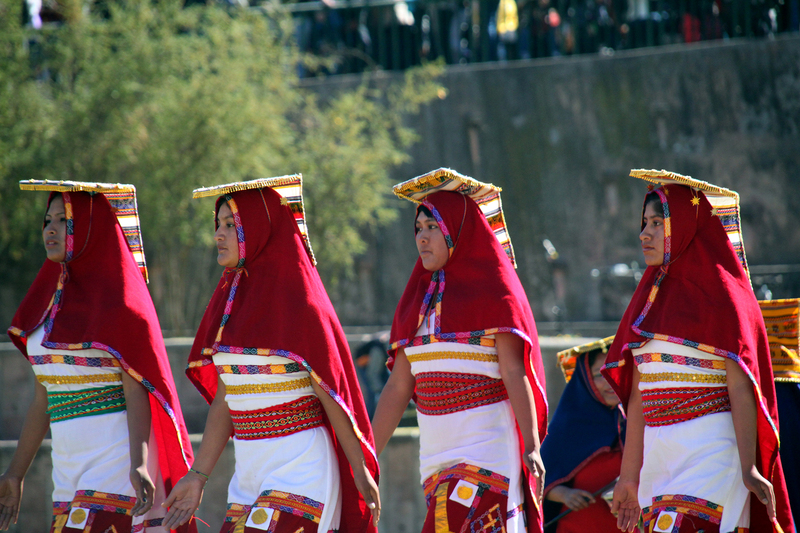 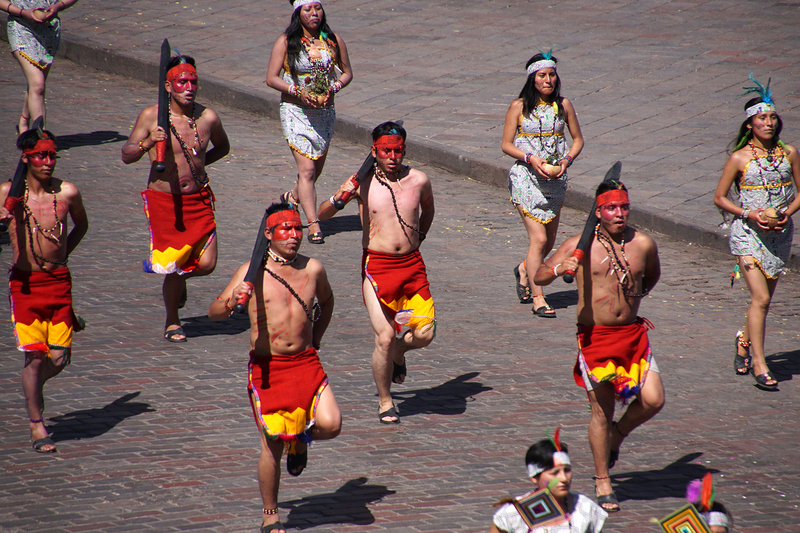 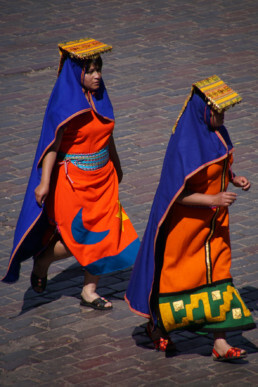 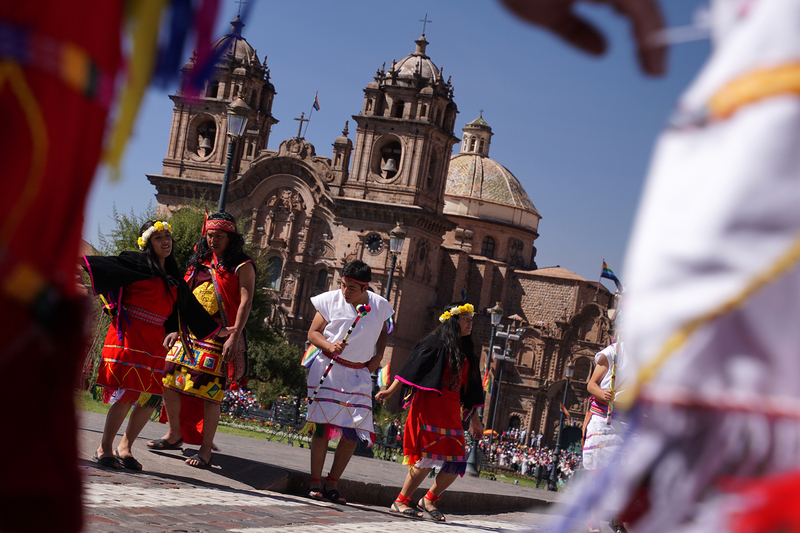 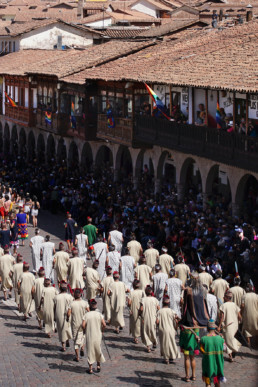 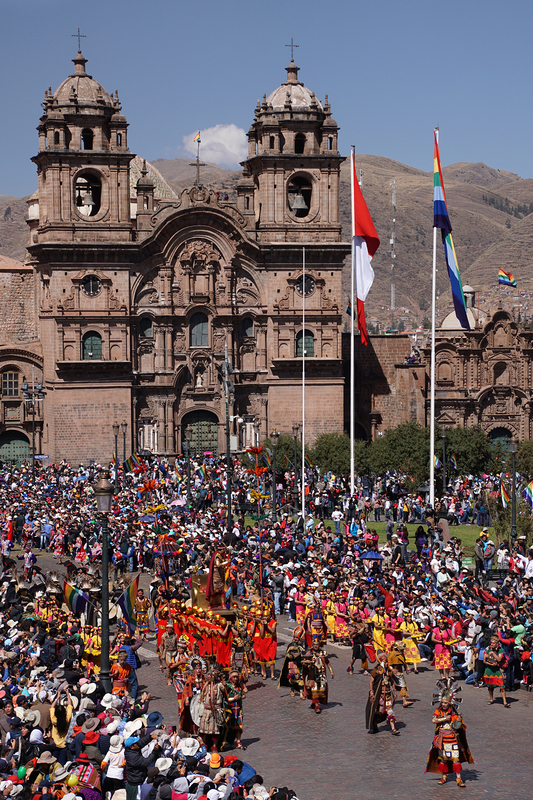 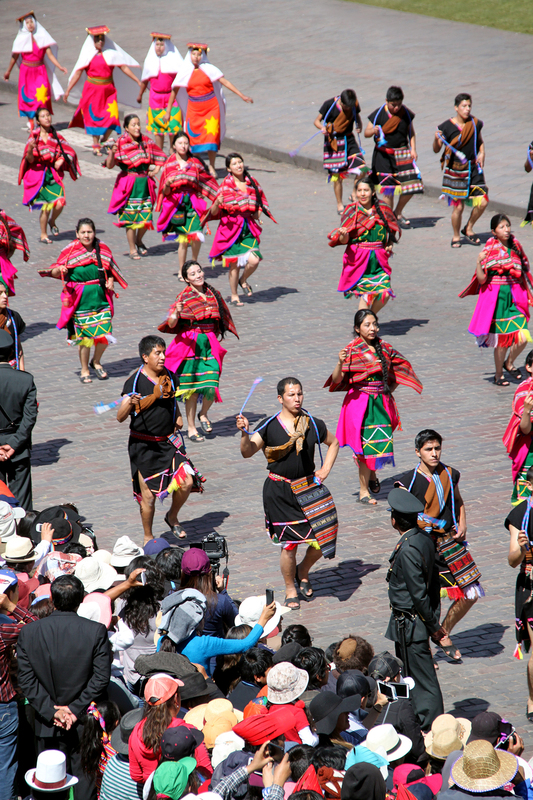 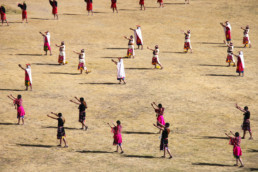 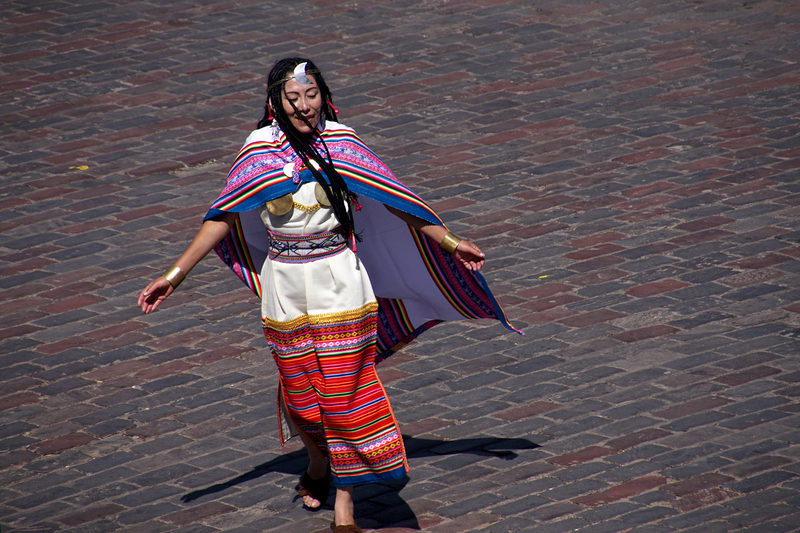 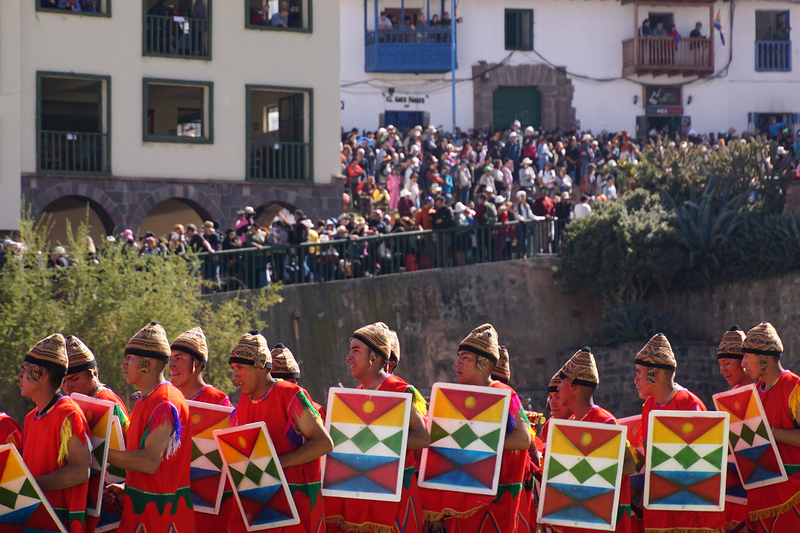 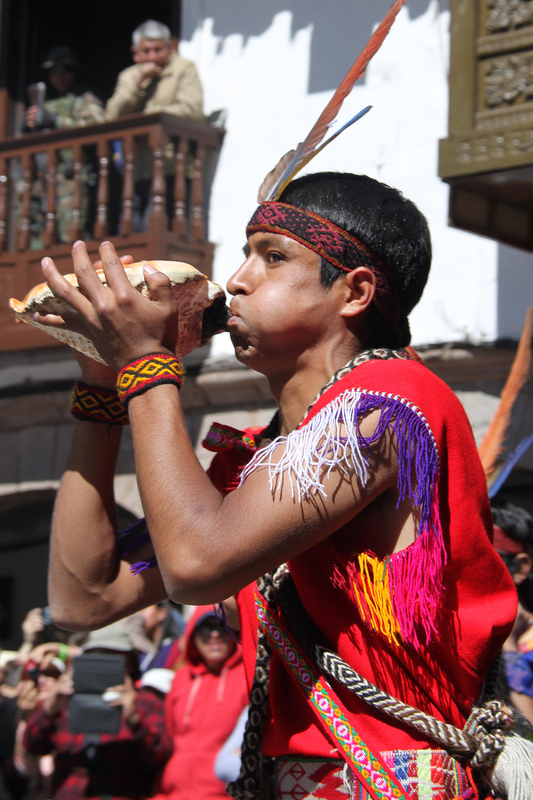 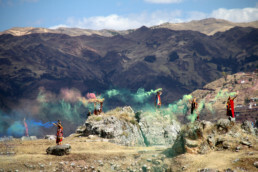 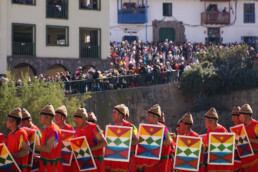 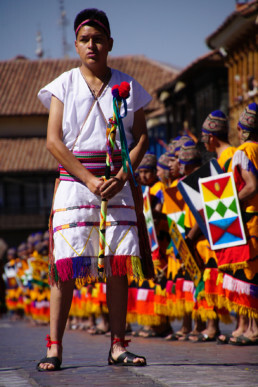 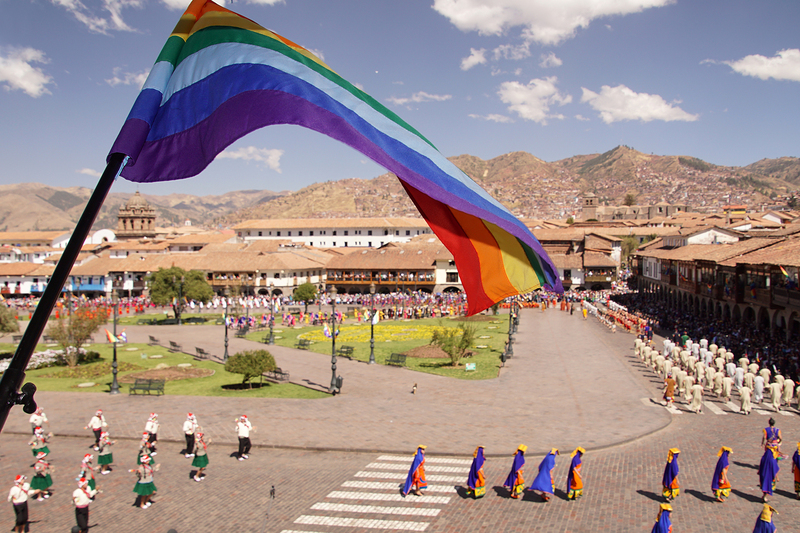 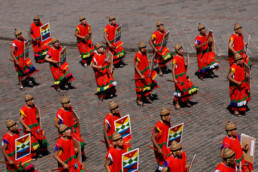 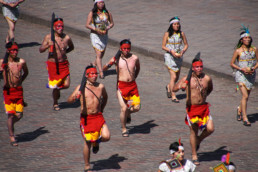 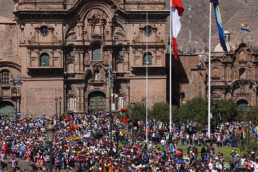 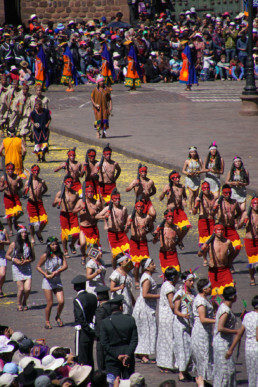 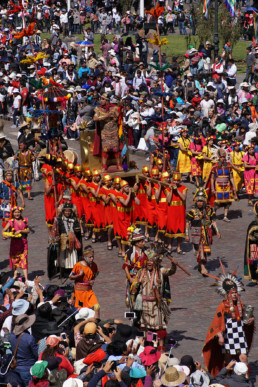 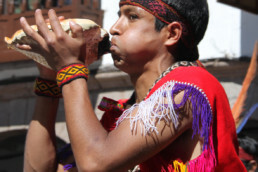 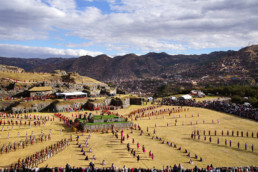 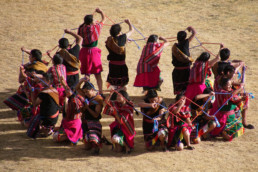 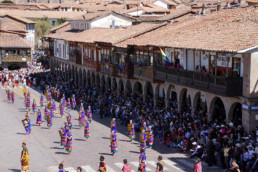 Inti Raymi celebrates the winter solstice and harvest and in Cusco it’s the event of the year, attracting hundreds of thousands of visitors who come for this theatrical week-long festival, with the main celebration on June 24 of each year. 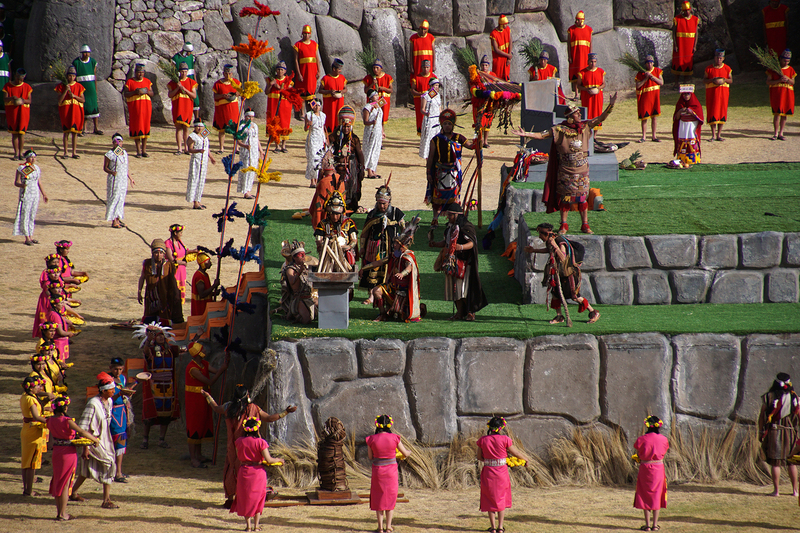 We managed to get a great spot at all the three different locations; Q’orikancha, Huacaypata (Plaza de Armas) and Sacsaywamán. 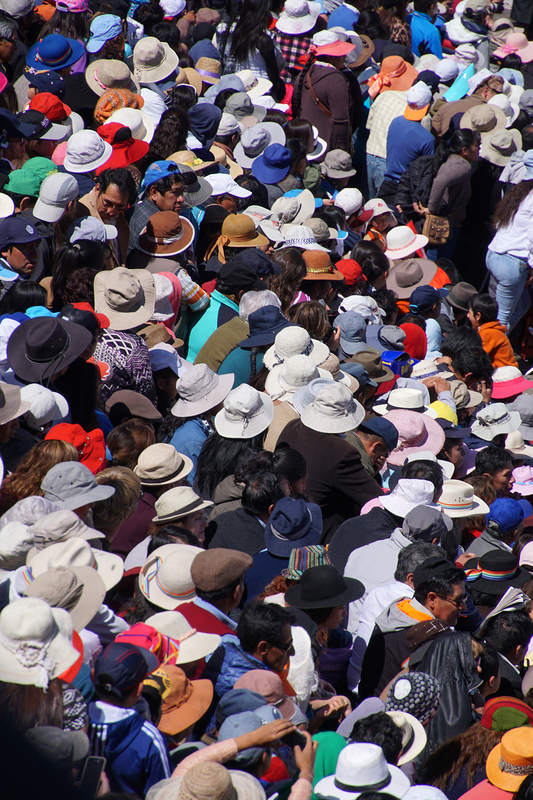 After taking some ultra touristic but irresistible pictures in the middle of the crowd, we found a spot on top of a couch at the first location. 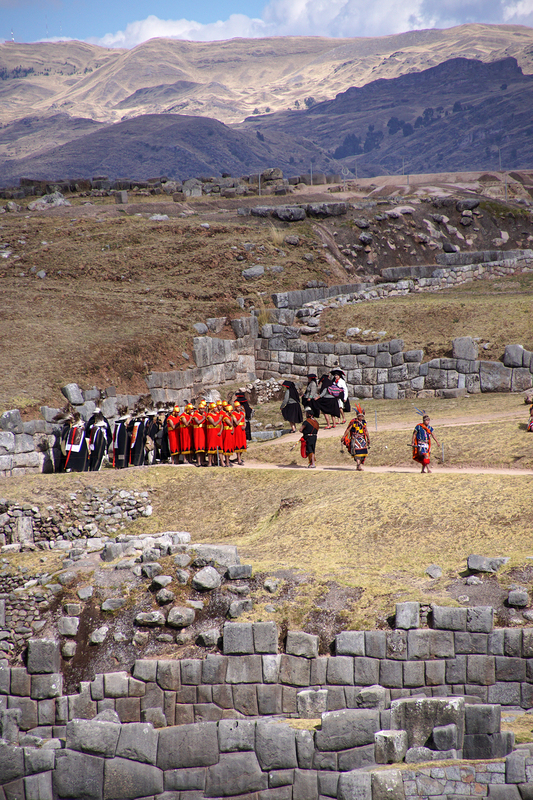 Helping each other to balance, we could perfectly watch the spectacle. 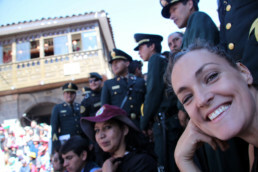 At the second spot we had a first row seat together with the policemen and later we moved to the balcony of a privately booked restaurant where we used our best French to appear to be one of the French tour group participants. 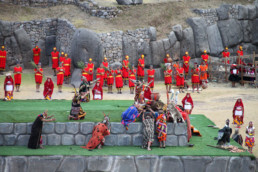 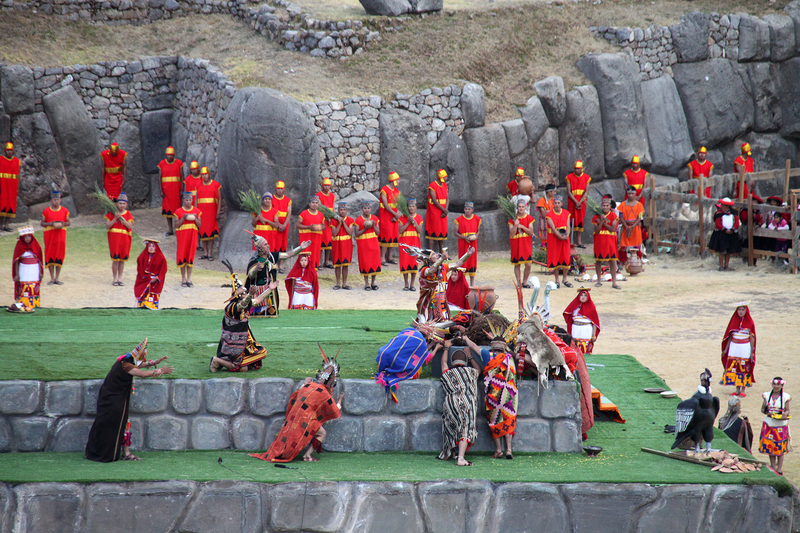 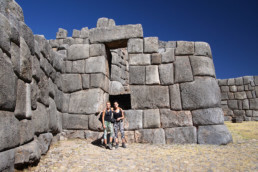 The most impressive site was the hefty stone ruin Sacsaywamán, with massive group dances and the now llama-sparing spectacle; a re-enactment of sacrificing the heart of a black llama. 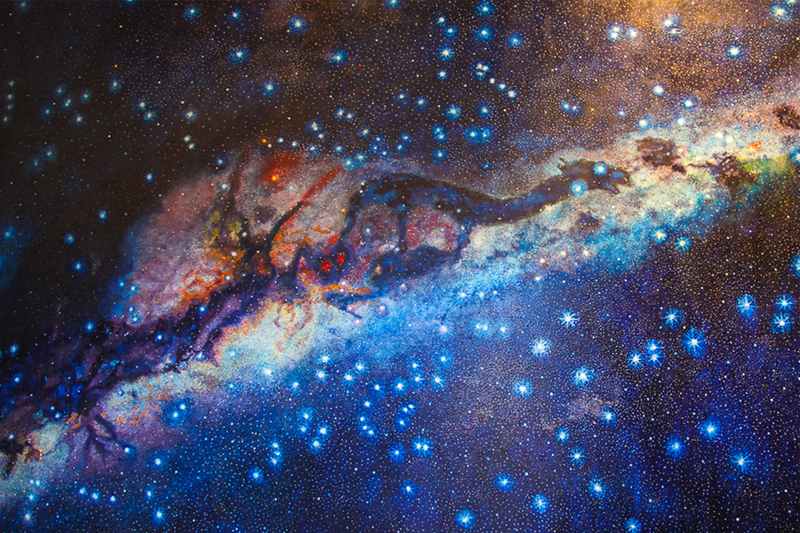 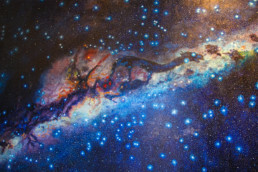 Locals told us that they choose a black llama because the stars are organised in the shape of a llama and the sky in between the stars is (of course) black. 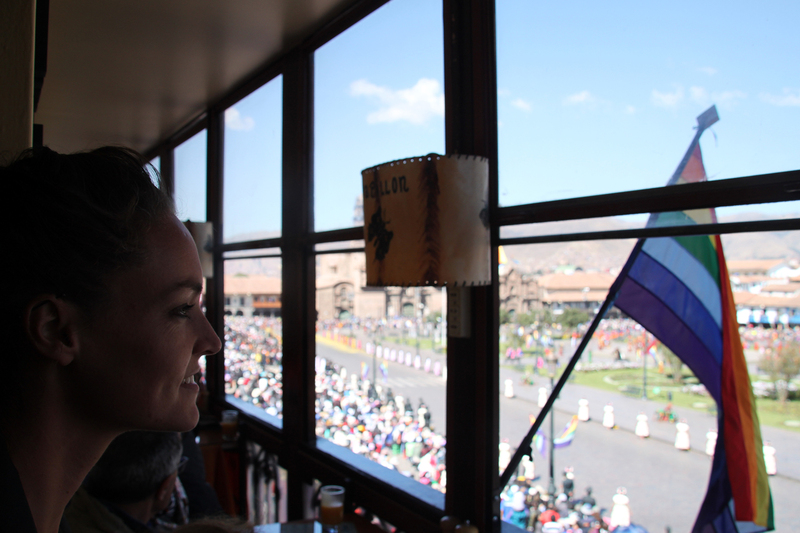 Our spot was beautiful, but not the most comfortable, so we made a sudden move over the fences and hide behind a wall. After a while, too many fellow spectators followed our example and the police noticed this and sent us away. 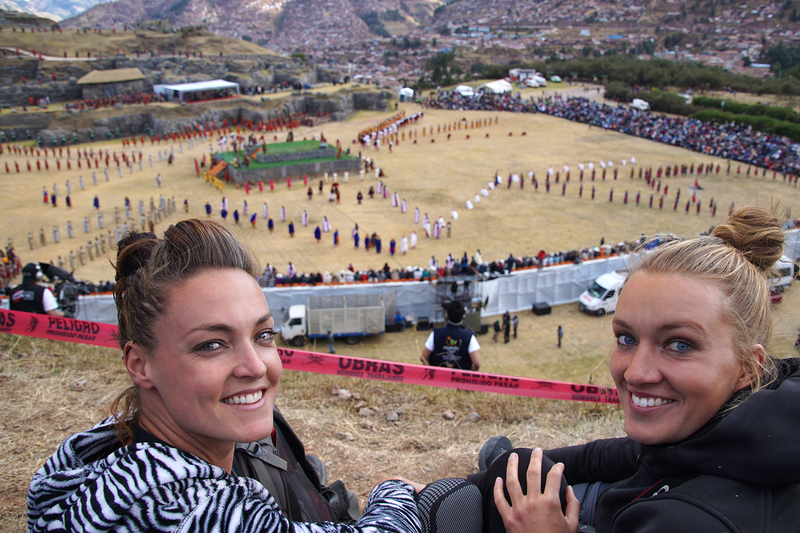 We then moved to an even better spot, perfectly overlooking the whole scene next to the camera man. 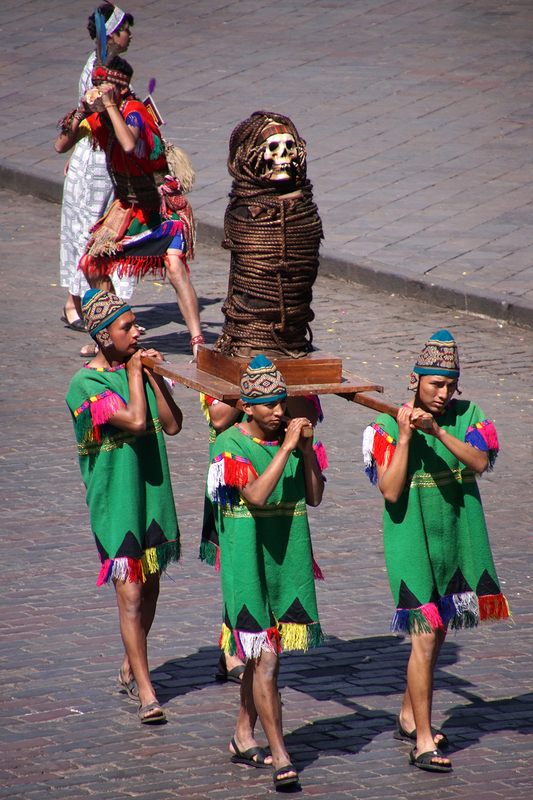 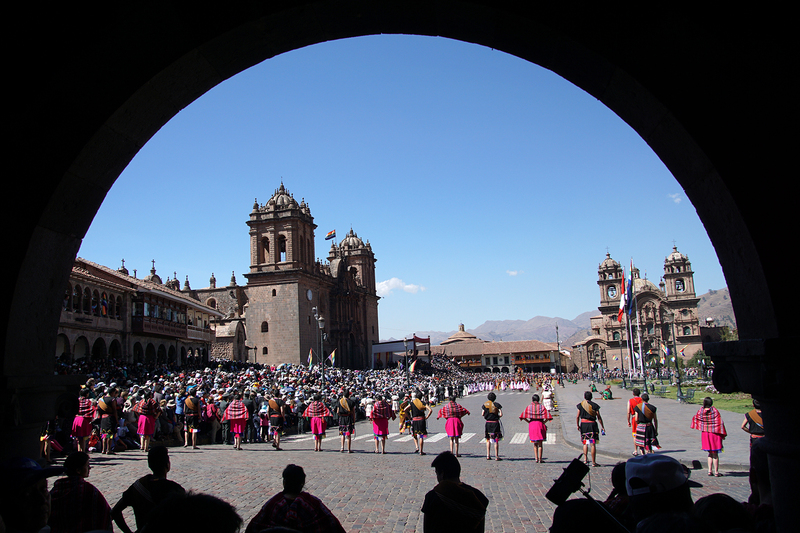 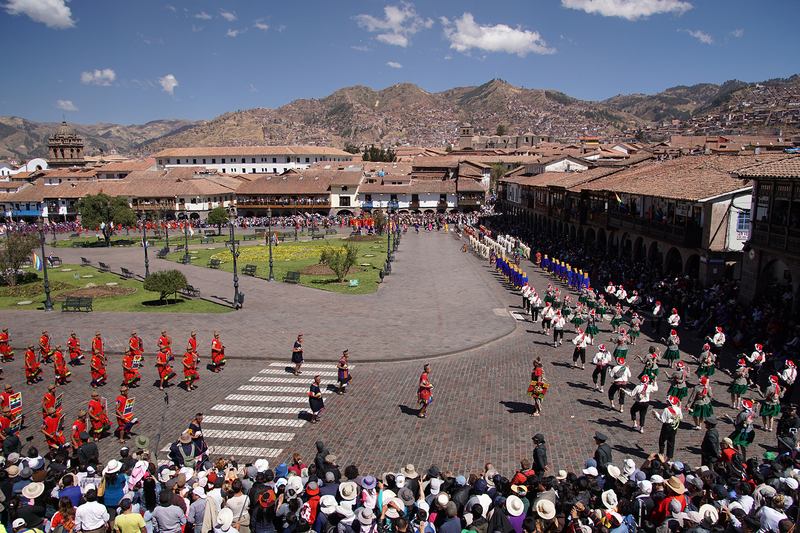 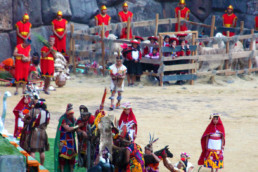 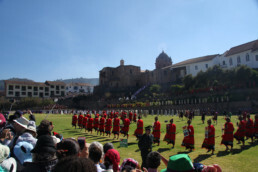 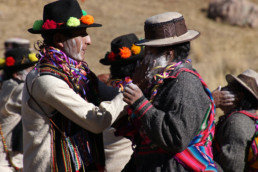 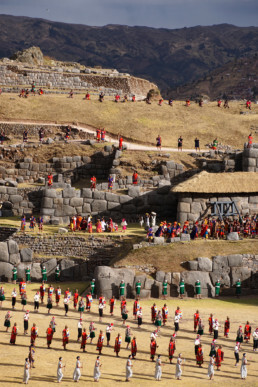 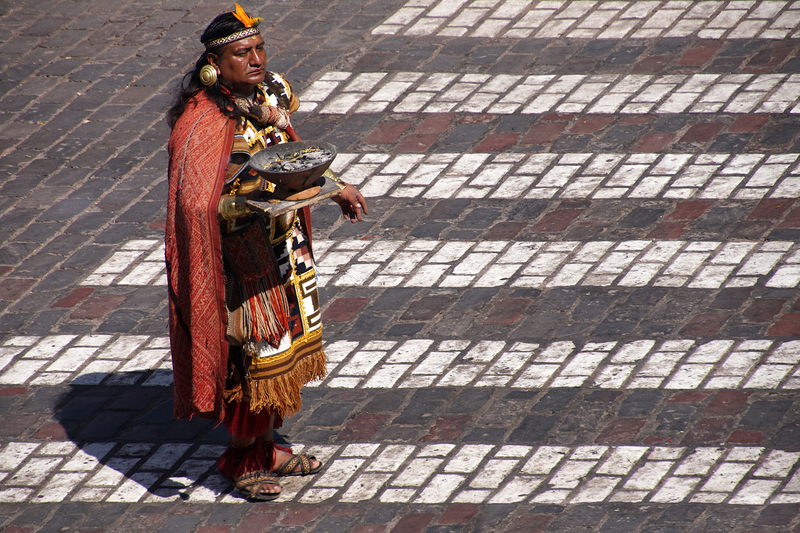 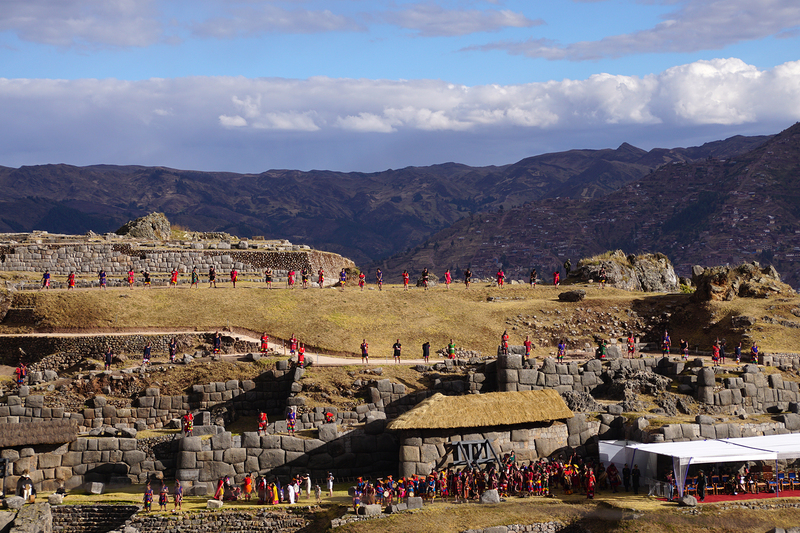 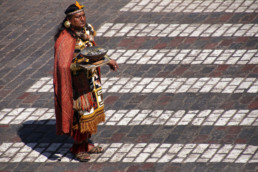 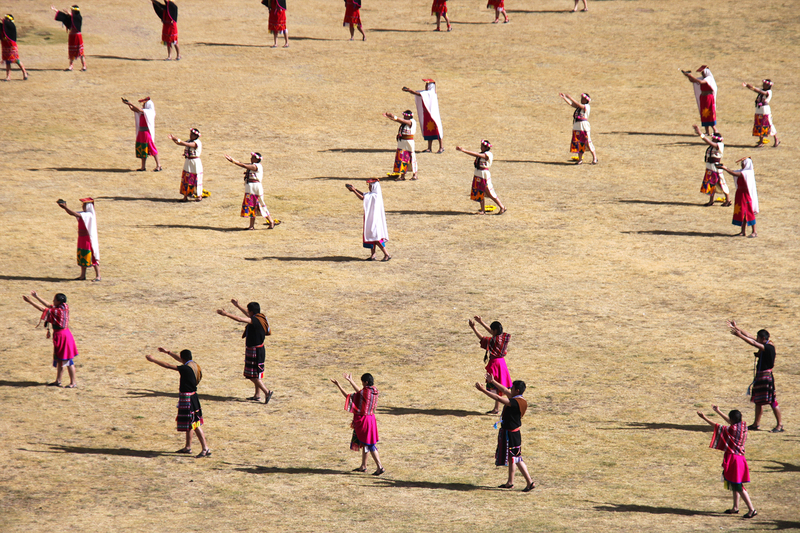 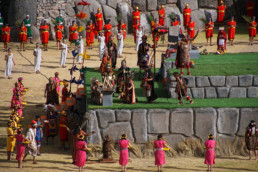 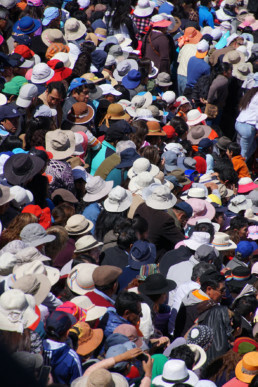 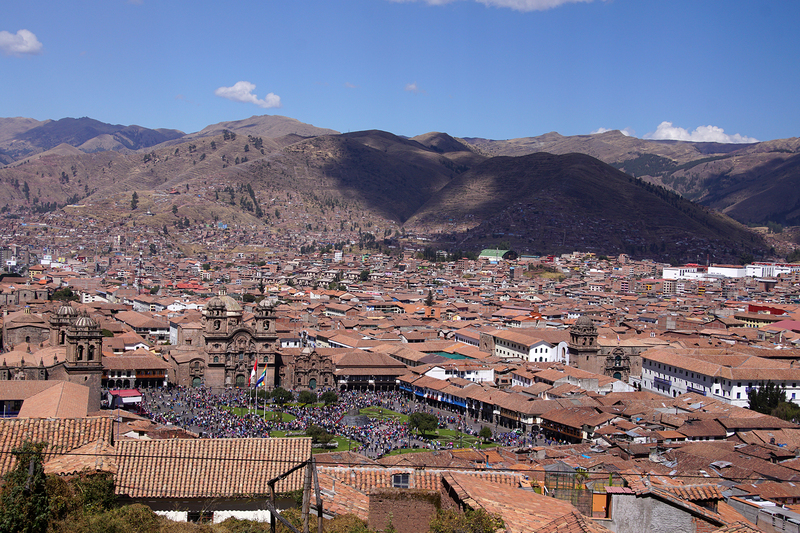 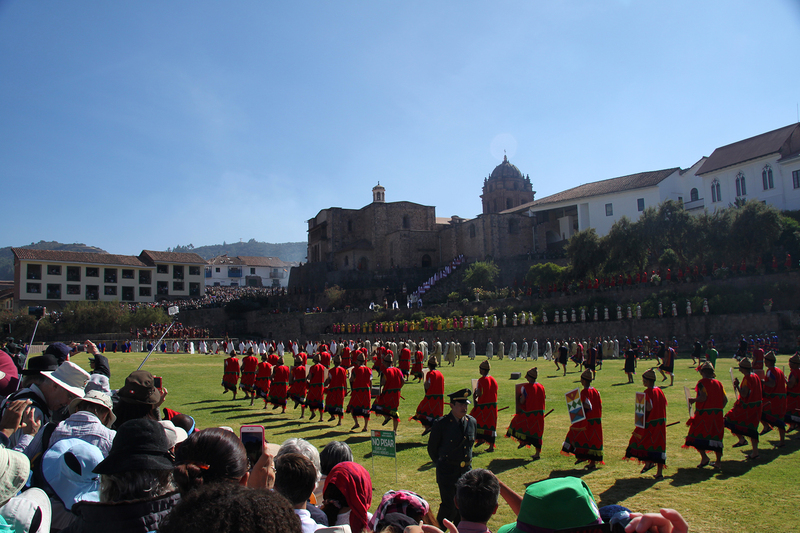 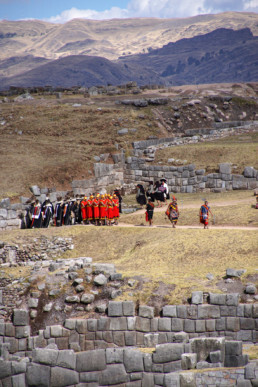 After a day full of new impressions the rituals came to an end and spectators started leaving the Inca complex. 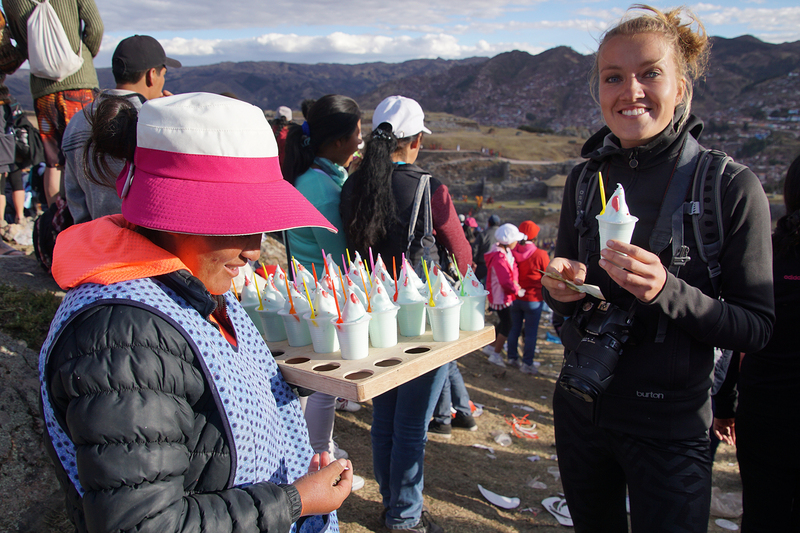 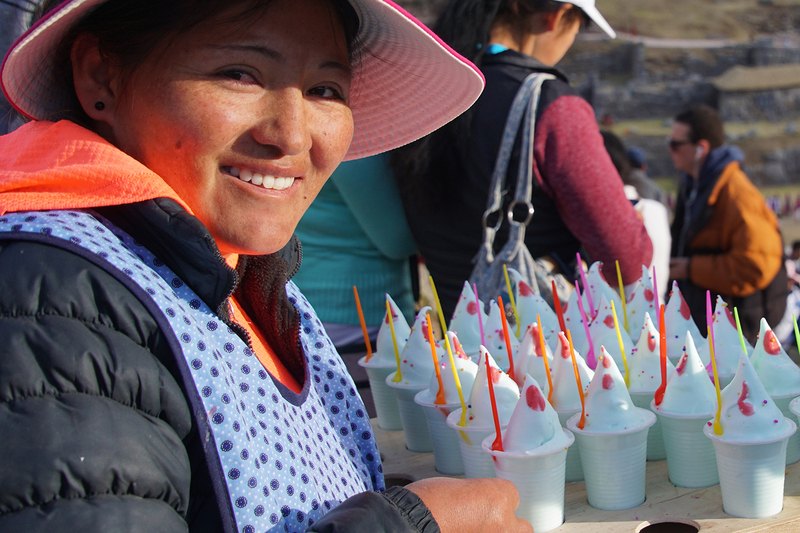 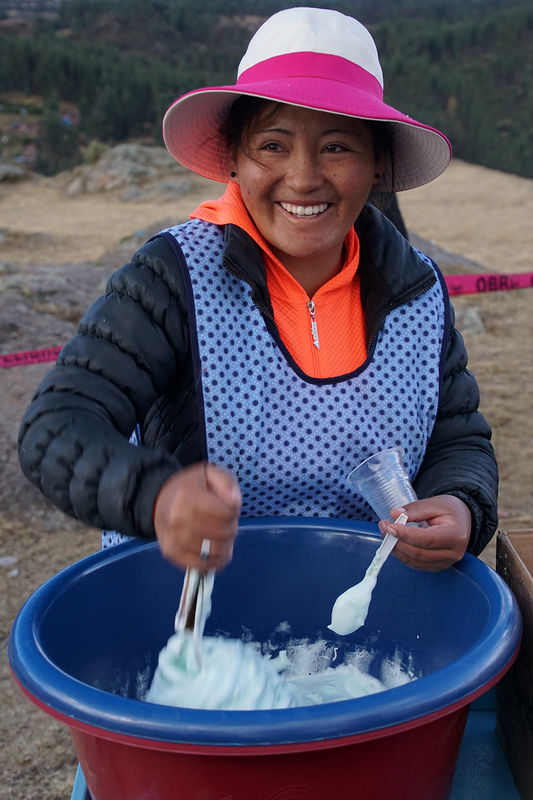 Ponchos were still being served and we had to buy one of these colourful, sugary egg fluffs. 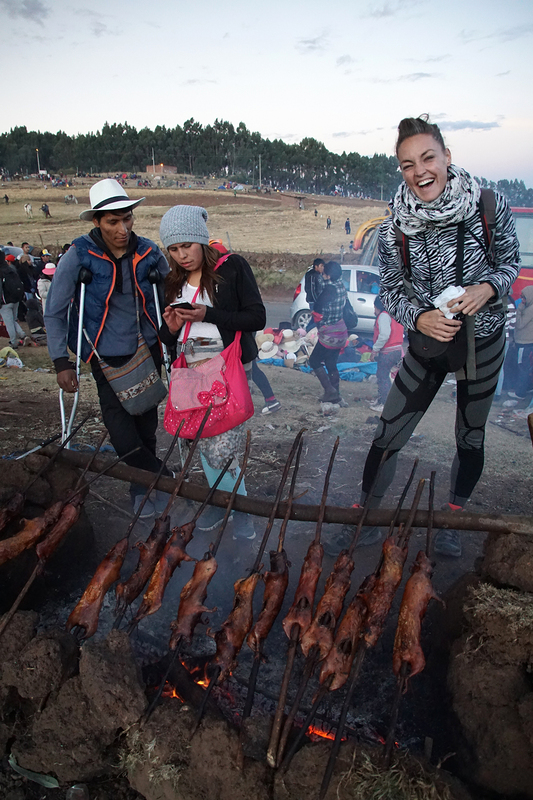 From the top of the hill next to Sacsaywamán we could see there was something else going on nearby; a fair with fun games and lots of local delicacies where we tried a fish dish, choclo (corn), some tasty chocolates and pineapple cake. 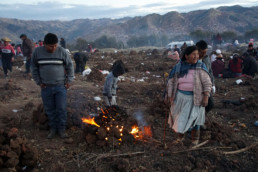 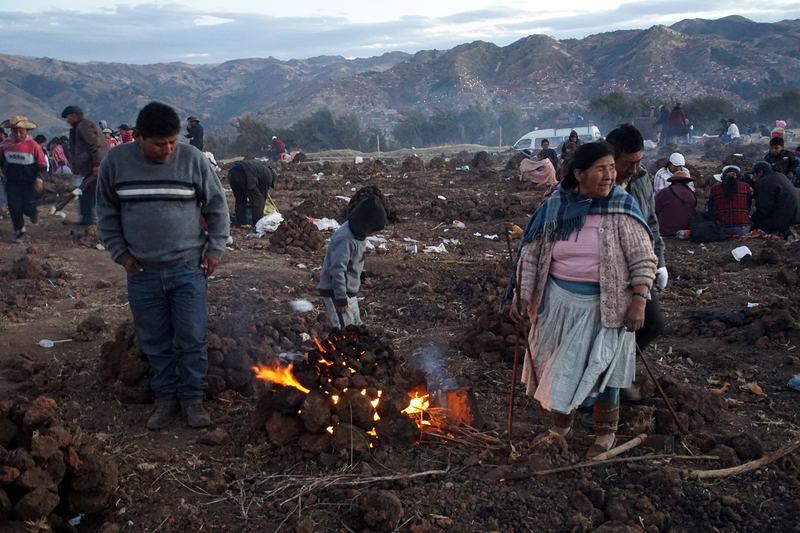 Next to the fair was a field overlooking Cusco, full of people building their own ovens in the soil, using stones from the ground. 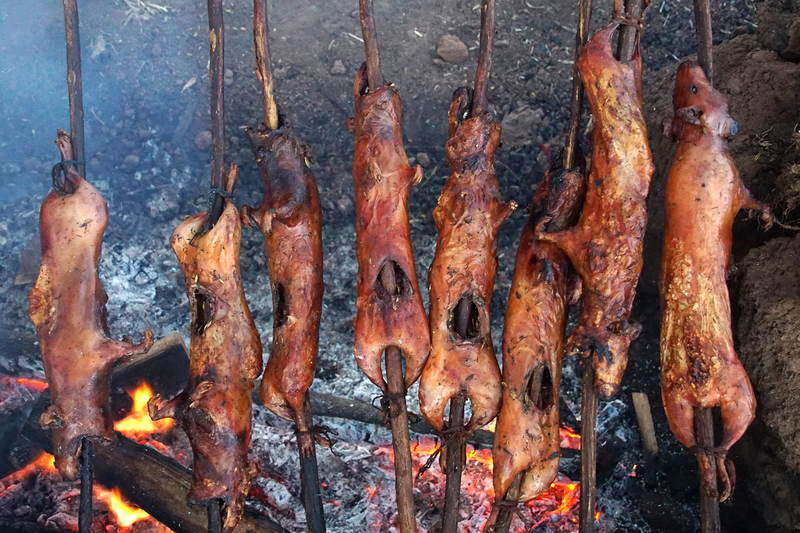 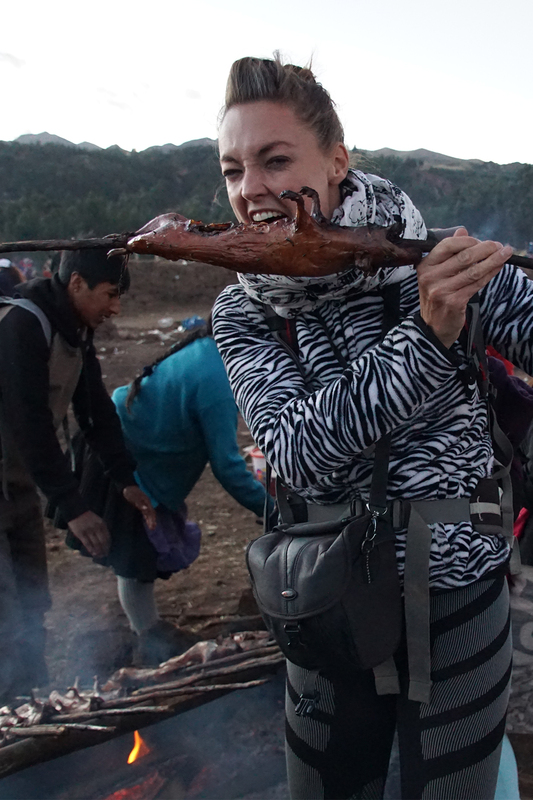 Admiring this cooking show, a group of Peruvians invited us to join their feast of potatoes, chuño (freeze-dried potato), the Peruvian delicacy cuy (roasted guinea pig) and sausages accompanied by their typical coriander sauce. 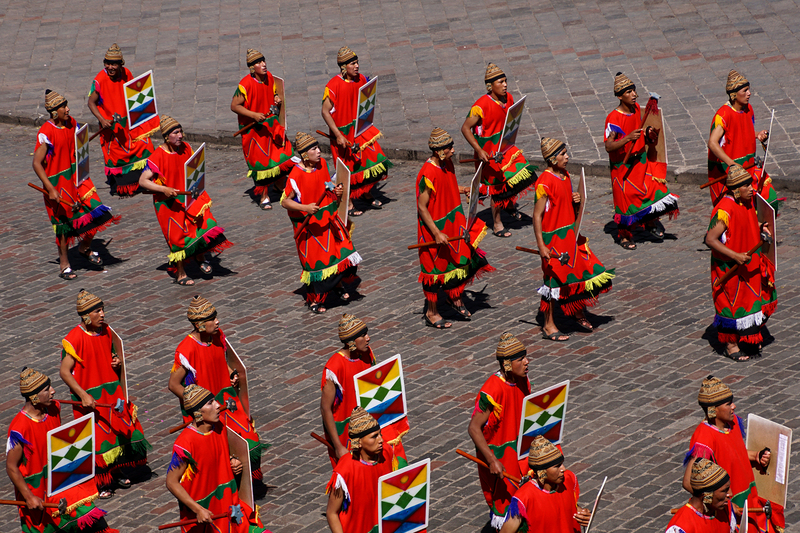 A great pleasure to totally immerse in the culture. 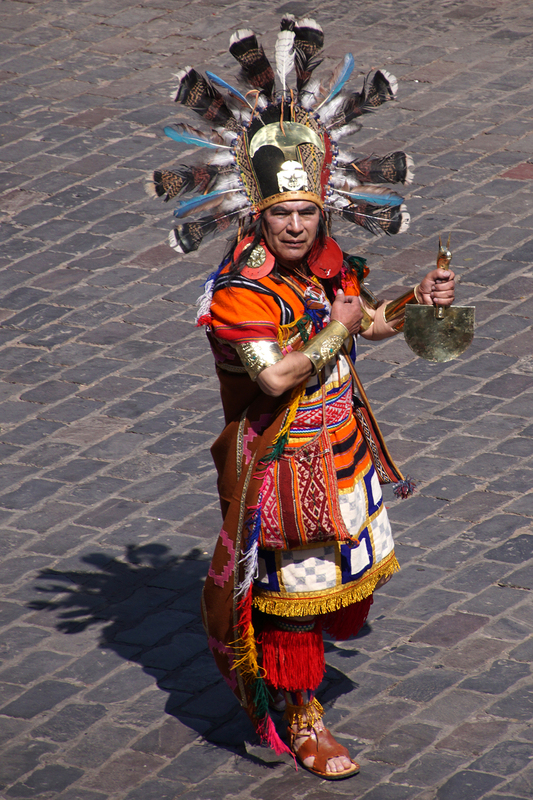 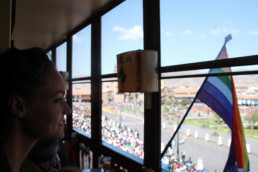 We feel very fortunate to experience this key Inca festival in Peru, although we liked Inti Raymi in Pucara even more, which was real local and felt more authentic. 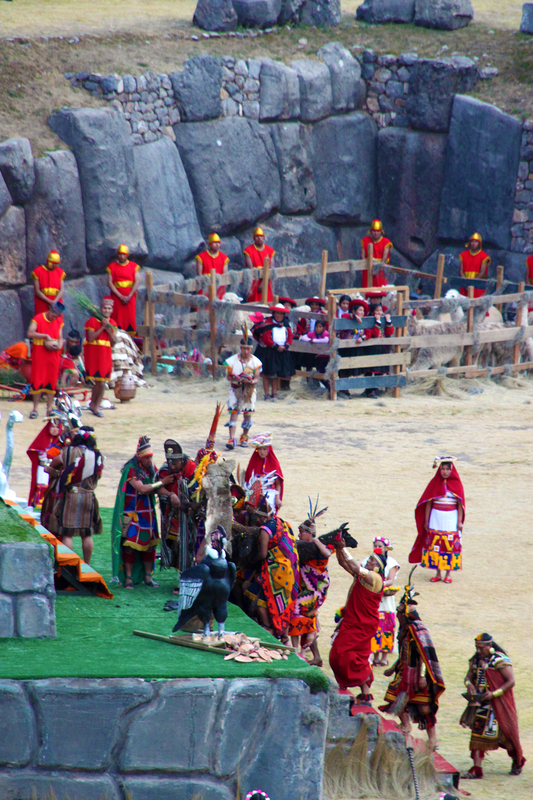 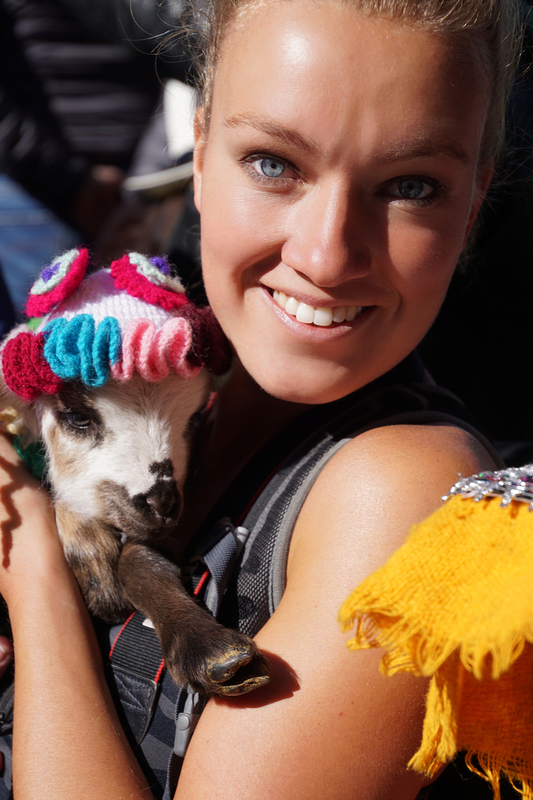 In Ollantaytambo, Inti Raymi gets celebrated on June 29. 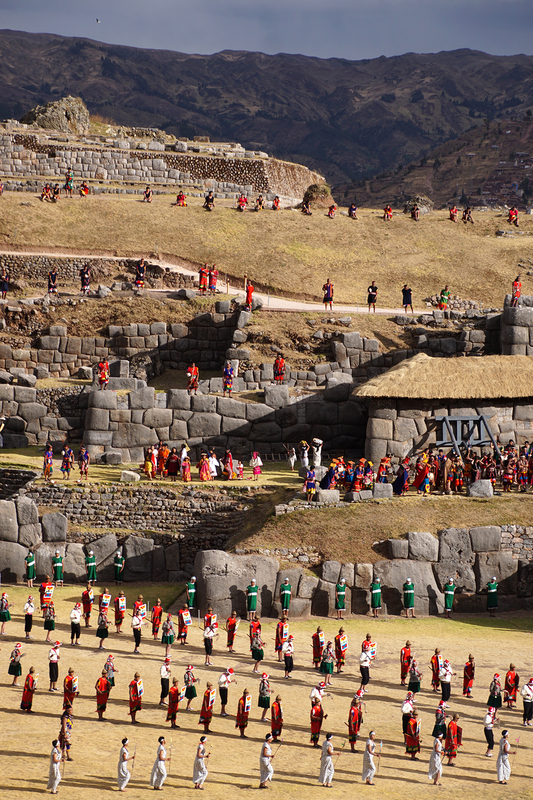 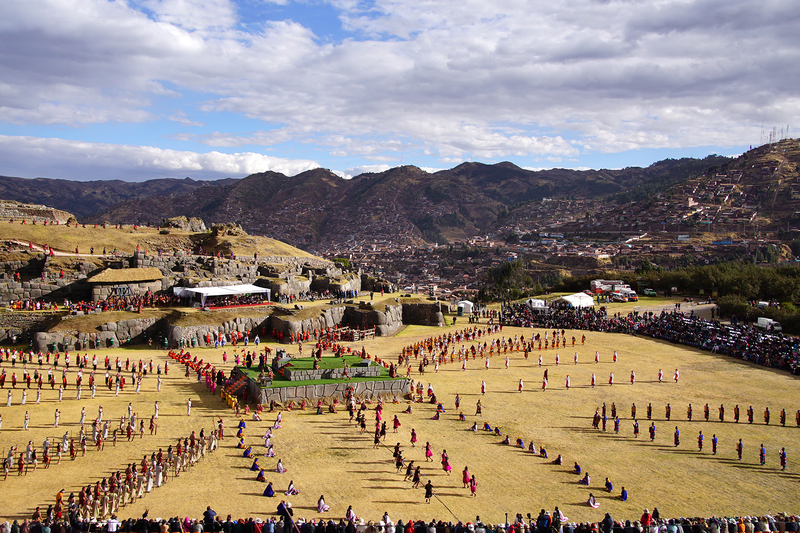 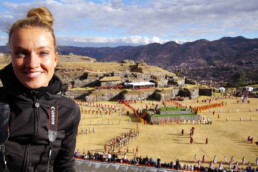 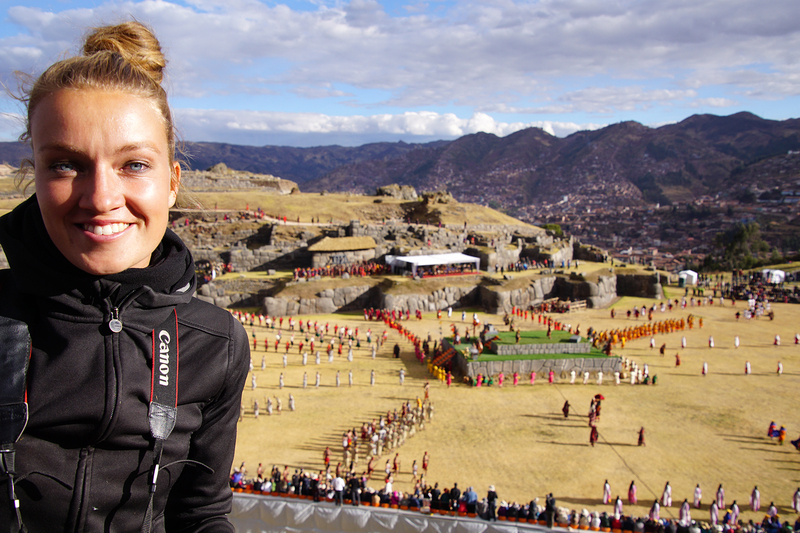 We were lucky enough to see the rehearsals the day before the actual celebration in this massive Inca fortress. 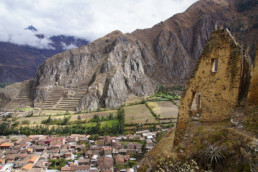 Peru is definitely the country of impressive ruins, with lots of cultural festivals in and around them, all with their own, unique splendour.